Make like Tarzan and Jane, and swing through the trees high above Bear Creek near the lush Herring Cove rainforest reserve on the exhilarating Bear Creek Zipline Adventure! The thrills start with an uphill ride over steep mountain terrain in a monster off-road vehicle called a Unimog, followed by a swing through the forest along eight ziplines of different lengths and height. As an exciting finale, you’ll also rappel down ropes from the exciting heights of the final zipline platform. Suitable for first-time zipliners and hardened adrenaline junkies alike, ziplining Ketchikan doesn’t get better than this! Round-trip transportation is provided for this 3 ½-hour tour, which starts with pick-up near the cruise docks in downtown Ketchikan. From the ziplining base camp in the Tongass National Forest, it’s a thrilling ride for the whole family up the steep and rugged mountainside aboard a monster Unimog all-terrain 4×4 vehicle. Get your breath back at the first ziplining platform and then get geared up and ready to go for the ride of your life, as you’ll be whizzing through the rainforest among towering Sitka spruce, western hemlock, and native cedars with Bear Creek flowing far below. Stop quietly at each platform to take in panoramic views of ocean, forest, and mountains. What’s more, you may even be lucky enough to spot eagles, bears, and other denizens of the rainforest. For the day’s final ziplining Ketchikan adventure, your experienced guides will fit you with harness and rope for a thrilling abseil from the final zipline platform back down to earth. If you’re after fun, adventure, and fresh mountain air, the Bear Creek Zipline Adventure will have you swinging into action! Note: If you’re looking for a more adventurous ziplining excursion, then you may want to explore the Rainforest Canopy and Zipline Expedition. Guests must weigh between 70 – 250 lbs. and have a minimum height of 50 inches. This tour is for those who have previous ziplining experience or those looking for new adventure. You should be comfortable with heights, a short easy walk on a maintained trail and ascending/descending some stairs., This tour is not suitable for people who are pregnant or have certain medical conditions such as neck or back injuries. How many ziplines are included on this tour? Answer: This tour consists of 8 ziplines and 1 Skybridge that connects 2 of the platforms. Answer: It's very rare that a ship is delayed into port, but in those cases we will try our best to work with you to reschedule the tour to a later time. If that is not a possibility or your ship doesn't make it into port, we will of course refund the full cost of the tour. What makes this zipline tour different from any other in Alaska? Answer: It's true that you'll find several ziplining options along the cruise route, and this one can be distinguished mainly by its location. 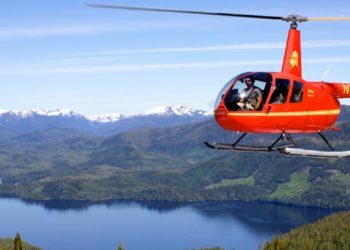 Nestled in a private reserve next to Tongass National Forest, wildlife sightings are much more common on this ziplining excursion than any other in Alaska. Answer: Safety is fundamental to this tour, and the course is inspected weekly, monthly, quarterly, and annually. Dual ziplines means you are connected to 2 cables while ziplining, and you are connected at 4 points at all times throughout the course, even between stations. For each group of zipliners, you will have 2 certified guides that are versed in First Aid/CPR and AED certification. What should I bring? Are cameras okay? Answer: Some guests show up with the clothes on their back and the smile on their face. Other guests show up with a small backpack that contains an extra clothing layer, a bottle of water, a snack and other personal items. So, it's up to you! Space is often limited on the shuttle, so it's best to keep your items to a minimum, but bring what you need. While on the tour, you're welcome to use your camera to snap photos of the beautiful scenery, yourself and your group! A smaller camera works best, but if you're comfortable bringing your DSLR you may; however, they can be burdensome while zipping at times. Keep in mind that you will be several stories above the forest floor at times while ziplining, so if you drop your camera it will likely not survive; for this reason, be sure that your camera has secure neck & wrist straps or is compact enough to fit in the small zippered hand pocket of the provided rain jacket. If bringing a large camera, the staff ultimately determines if your camera may be taken on the course, as it pertains to your safety and the safety of other guests and our guides. Once you arrive at the zipline course, your guides will collect the group's belongings and secure them. Upon completing your exciting tour, you will be able to quickly retrieve your personal items!